Imagine having everything you need to create a beautiful, thriving herb garden. This Indoor Planter from Geo Box provides you with an ideal, easy foundation for bringing a garden to life with your own two hands. One of the nicest things about this kit is the fact that it can work as a present for just about anyone. Whether you have lots and lots of space in your home to work with, or if you only have a limited area with which to work, this kit can be a perfect addition. Furthermore, any experience level with gardening can take advantage of everything this kit features. These organic, nonGMO seeds can be enjoyed by experienced gardeners, newcomers to the wonderful world of culinary herbs, and just about anyone else. If you are looking for a great activity that the whole family can enjoy, then you will definitely want to consider this kit. Don't forget that these herbs can later be used to add considerable flavor to your food. From spicing up your favorite dishes to creating a seemingly endless assortment of pesto and sauce possibilities, you are never going to run out of things to do. This kit is going to bring you hours of pleasure and enjopyment. EVERYTHING YOU NEED TO GROW 10 CULINARY HERBS: Basil, Parsley, Oregano, Cilantro, Arugula, Dill, Chervil, Fennel, Chives, Garlic Chives. 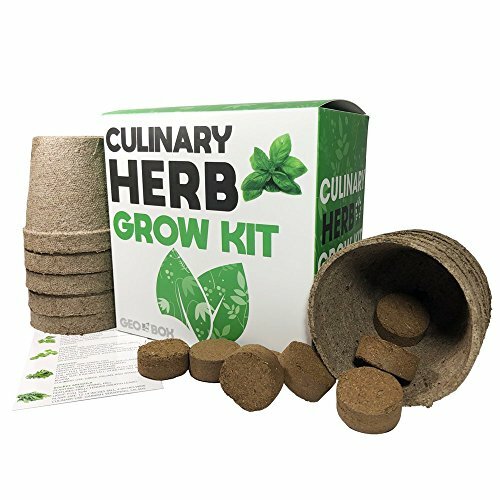 Each seed starter kit includes 10 biodegradable peat pots, 10 expandable soil discs, 10 popular culinary herbs, 10 plant markers, and 1 instruction booklet. SPICE UP YOUR KITCHEN. Enjoy the uses and benefits of having fresh herbs at home for cooking, spicing dishes, making pesto, sauces, flavorful dishes and the list goes on. Knowing that you have grown these herbs yourself will make their addition to your cooking even more special. instruction booklet. AMAZING GROWTH PERFORMANCE: Each seed is organic and non-GMO, sourced from local growers, right here in the USA. The kit contains the highest quality planting supplies, organic peat pots, and nutrient-rich soil discs. Everything was put together to simplify seedling development. Each kit is proudly assembled in the USA. If you have any questions about this product by Geo Box, contact us by completing and submitting the form below. If you are looking for a specif part number, please include it with your message.